Summer at the #BestSpotInBuff just like Easter Champagne Buffet! 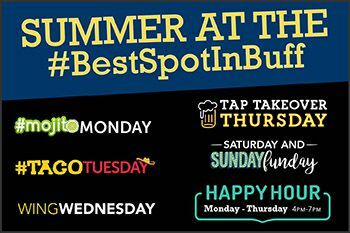 Summer at #TheBestSpotInBuff is one you do NOT want to miss! Enjoy our daily summer specials kicking off June 18th! View the daily summer specials here! *Summer specials begin Monday, June 18th. Deck Only. 4-7pm.